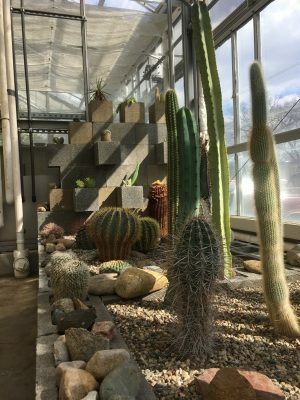 The Ludington Greenhouse is a hidden gem of Albion College’s campus. Located in the Science Complex, the greenhouse is three rooms filled with a variety of tropical and subtropical plants, with everything from banana trees to vanilla vines. The main use of the greenhouse is growing plants for classes like Vascular Plants and Ecology. 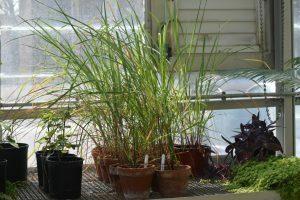 The art department makes use of the greenhouse plants as well in classes like Drawing, Photography and Earth, Art and the Environment. Often students’ projects in these classes involve growing plants under different conditions and in colder months of the year. They may need to grow plants for “an experiment, to measure them along the way, and to harvest them and collect data that can then be used in statistical analyses to see if their hypothesis in a study has been supported or rejected,” said biology professor Dan Skean via email. 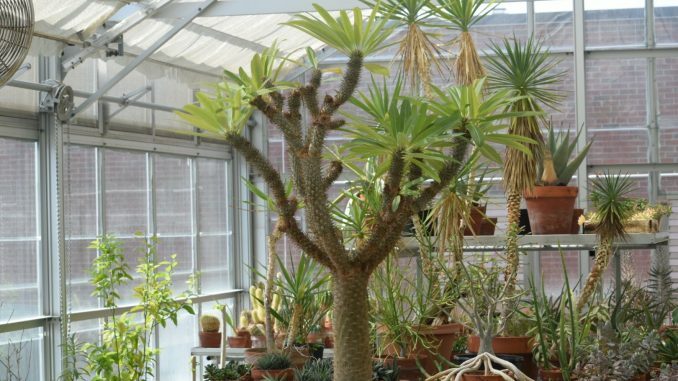 Melissa Goodell, the college greenhouse keeper, maintains the plants. “The greenhouse gets used for all sorts of weird things,” said Goodell. “I’ve had people come in to collect insects, which we usually try to kill but I guess a class wanted to study them.”. Goodell has been working at Albion since April of 2000 when the greenhouse was located in Olin Hall. Since then, she grows and catalogs all the greenhouse plants. She has also assisted with class projects, like one art course that was tasked with creating a rain garden, a vegetated area of line designed to soak up storm-water runoff. Goodell helped students decide which plants to grow and where to put them. Another task of Goodell is to help decide what plants are worth keeping and what to do with plants that aren’t. Goodell also has student assistants who help maintain the plants. Much of their work includes figuring out which plants are struggling with bugs and then hand cleaning or spray washing them with water to debug them. The greenhouse also propagates plants for each year’s two plant sales on campus. The sale in the fall is run by the Center for Sustainability and the Environment and usually includes small houseplants for students to have in their dorms. The spring sale is bigger and includes more of a variety of plants that the greenhouse no longer needs for classes. The next plant sale will be later this month. A date has not yet been set. The Ludington Greenhouse can only be accessed through a course utilizing its space or by permission of Melissa Goodell.